Old Orchard Park is operated under the authority of the Township of Oscoda, on land leased from Consumers Energy Company. 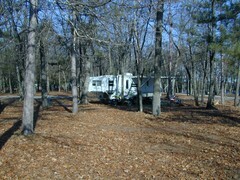 We would like to invite you to visit or stay at Old Orchard, which is one of the largest campground in Northeast Michigan. Located within the Huron-Manistee National Forest, along the River Road Scenic Byway, the park which is over 3½ miles long, overlooks Foote Pond (1,702 surface area) formed after the construction of Foote Dam in 1916, on the AuSable River. Open year-round, it also has a public winter sports park for sledding and cross-country skiing and hosts the annual Snowbox Derby.